Benign Paroxysmal Positional Vertigo (BPPV) is a condition is which certain positions trigger bouts of severe dizziness and nausea. Here we discuss some treatments and exercises that have been shown to help resolve acute episodes of BPPV. Benign Paroxysmal Positional Vertigo (BPPV) or simply just positional vertigo is a common condition in which certain positions trigger severe bouts of dizziness and nausea (vertigo). This is caused when crystals in the semi circular canals of the inner ear become dislodged, it is this change that brings on the extreme dizziness and nausea as the body is unable to use its vestibular (balance) system correctly. There are a few treatments which are administered by health professionals that involve trying to reposition these crystals and they generally have good results. 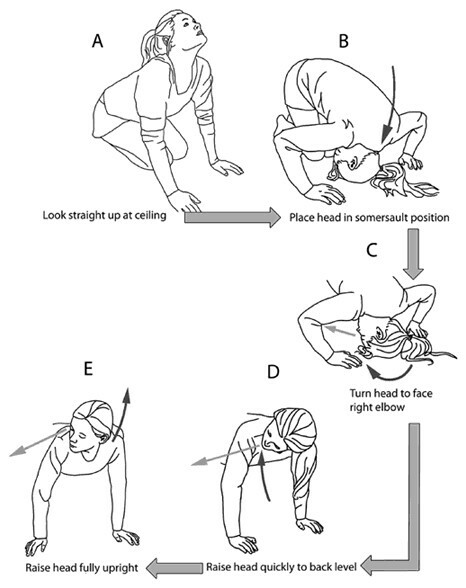 A study by Foster in 2012 compared the effect of applying ‘Epleys manoeuvre’, the most commonly used manual treatment for positional vertigo and a new manoeuvre named the ‘Half Somersault Exercise’ which is much easier for the patient to perform by themselves at home, making it perhaps a more accessible treatment option for positional vertigo sufferers. The study compared 2 groups (1 group treated with Epleys manoeuvre, the other with the Half Somersault Exercise). Both were found to be effective in reducing vertigo symptoms, but it was found that the group that performed the Half Somersault experienced less treatment failures than the Epleys and less vertigo symptoms during the exercise. The Half Somersault exercise can easily be performed at home by following the instructions to the left, here is a link to a video in which Dr Foster explains it in more depth. The diagram is showing the manoeuvre for a patient that is suffering positional vertigo of the right ear. Foster, C. A., Ponnapan, A., Zaccaro, K., Strong, D., & Audiology, C. (2012). A Comparison of Two Home Exercises for Benign Positional Vertigo: Half Somersault versus Epley Maneuver. Audiology and Neurotology Extra, 2(1), 16-23.